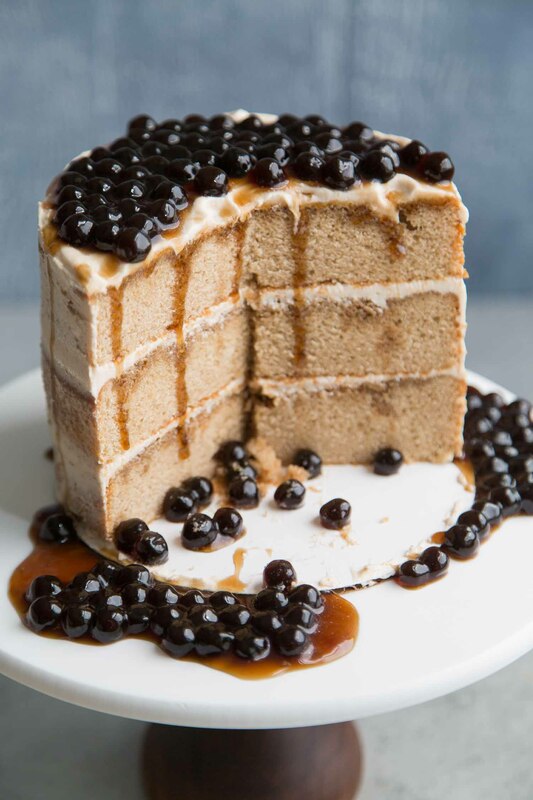 This boba milk tea cake consists of sweet black tea infused cake layers, milk tea buttercream, and warm brown sugar tapioca pearls. 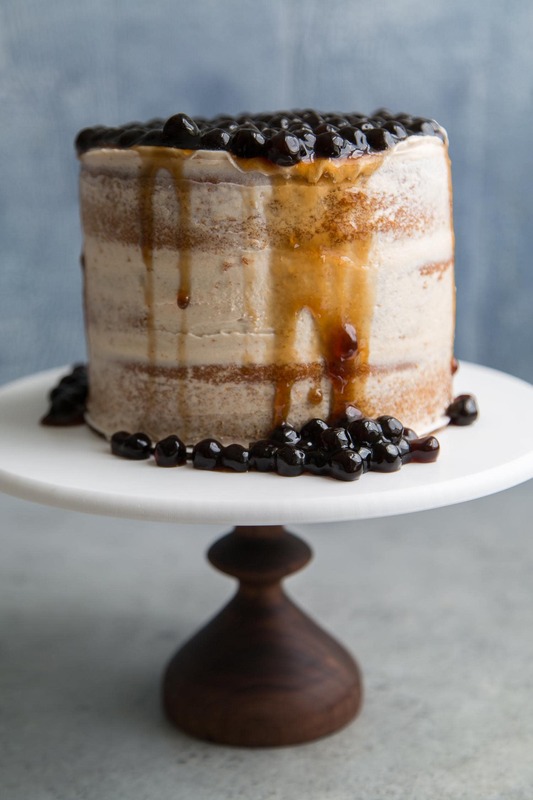 I’ve been dreaming about this boba milk tea cake for quite some time. It’s been a long time coming but I’ve finally perfected the recipe. 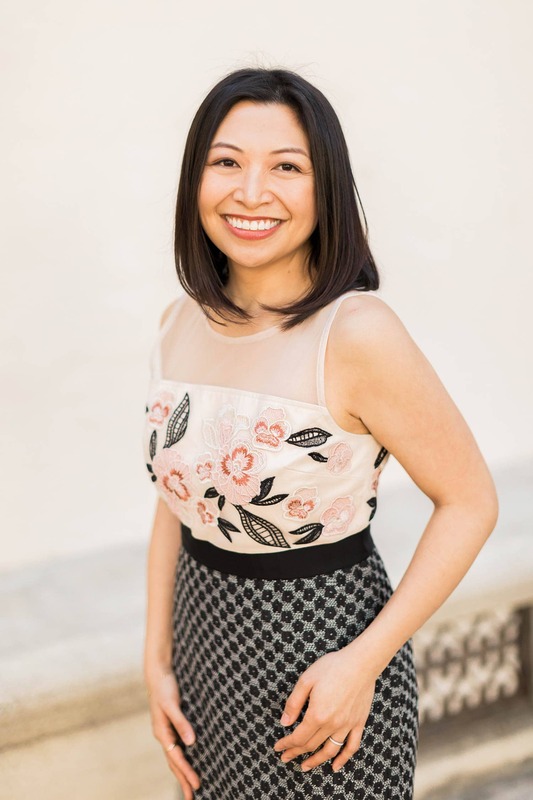 Some people may reward themselves by shopping, getting a massage, or going to happy hour. I reward myself with boba milk tea. Growing up, I enjoyed this stuff ALL THE TIME. Maybe a little too much. Now that I’m a tiny bit wiser and more concerned about my eating habits, I limit myself. Why? Because boba milk tea tends to be packed with sugar. It’s a sweetened tea mixed with milk (or non-dairy creamer) and topped off with sweet starchy tapioca pearls. It’s a dessert that’s much to easy to drink and devour instantaneously. Of course, I took this sweet drink and translated the flavors into a celebration cake. In honor of my 33rd birthday, here’s the boba milk tea cake! What is boba milk tea? 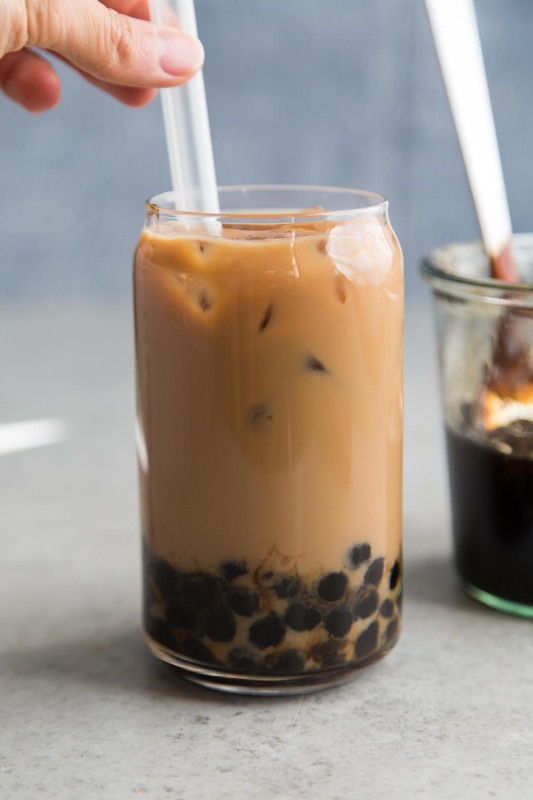 Also known as bubble tea, pearl milk tea, or tapioca tea, boba milk tea refers to this Taiwanese beverage consisting of brewed tea, milk or non-dairy creamer, sweetener, and chewy tapioca balls. Any tea can be used to make this drink, and it can be served iced or warm. On its own the boba (cooked tapioca pearls) does not have any pronounced flavors. It usually gets infused with either maple syrup, brown sugar, or honey for flavoring. I prefer a combination of maple and brown sugar. I must warn you. This is a very involved cake. There are numerous components. However, can complete the different parts over several days to make assembling this cake more manageable. YOU CAN DO IT! DAY 1: Bake the cake. DAY 2: Make the simple syrup and milk tea concentrate. DAY 3: Make the buttercream, cook the boba, and assemble the cake. I adapted the cake recipe from my Apricot Chamomile Cake. 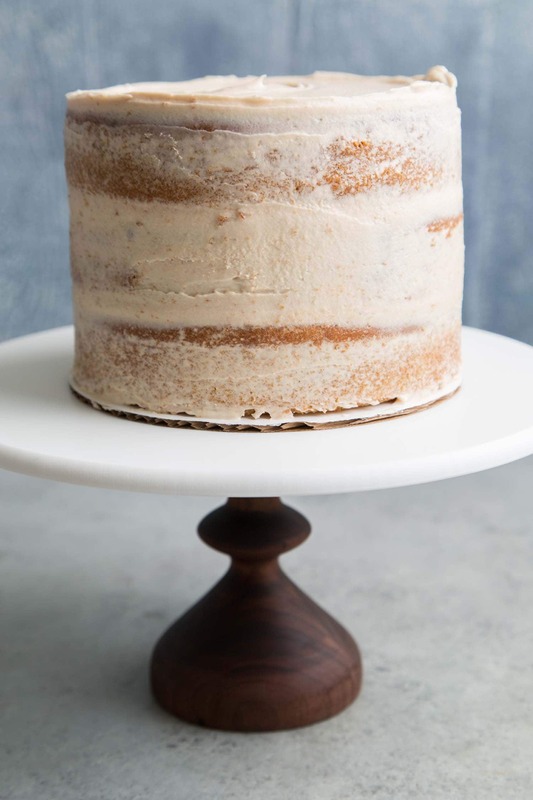 Rather than the usual creamed butter/sugar mixing technique, this cake requires you to mix the batter a little differently. The dry ingredients are added to the mixer first, then the butter is slowly added making for a crumbly mixture. This technique lends for a tighter cake crumb, meaning smaller air bubbles in the bake cake layers. The mixing may seem weird, but trust me! It’ll work out. 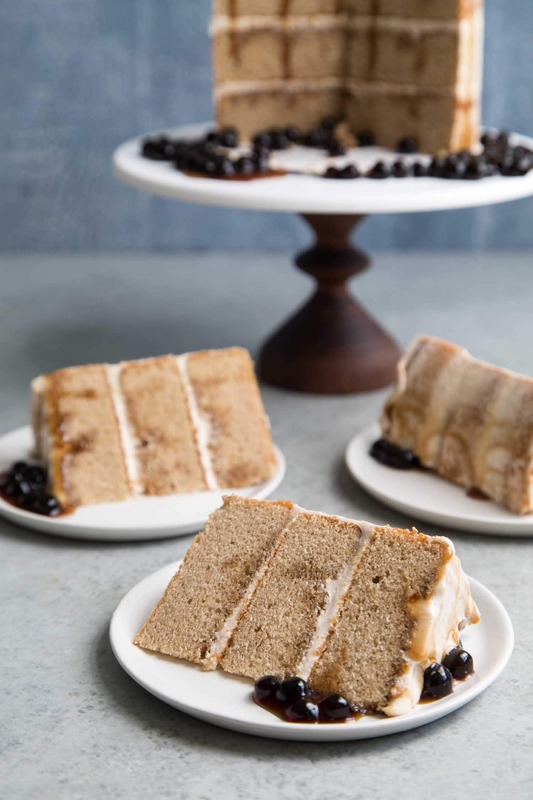 The recipe for this boba milk tea cake makes three 6-inch cake layers. The milk used in the cake recipe is steeped with black tea until it’s super potent. This lends to the caramel color of the cake. During assembly, the cake is soaked with a mixture of black tea simple syrup and milk tea concentrate. This helps to highlight the tea flavors of the cake. 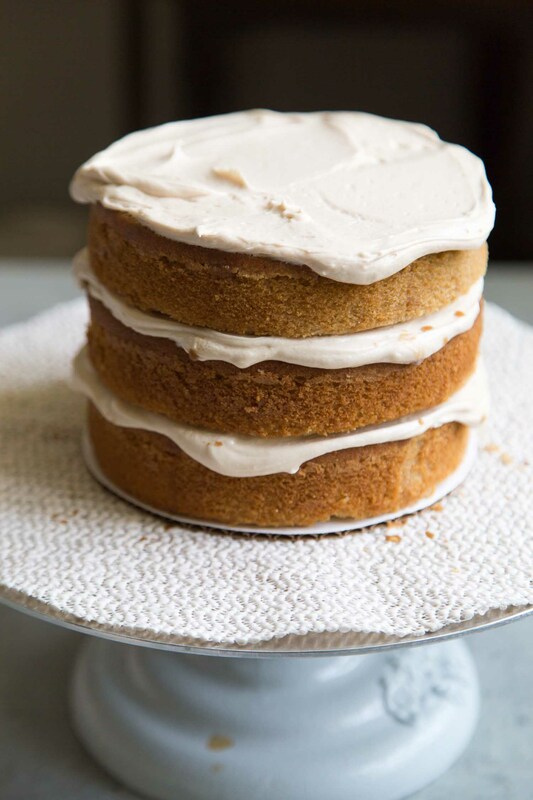 The frosting is a simple American style buttercream made by creaming butter with powdered sugar. It’s flavored with black milk tea concentrate and enhanced with a touch of vanilla. 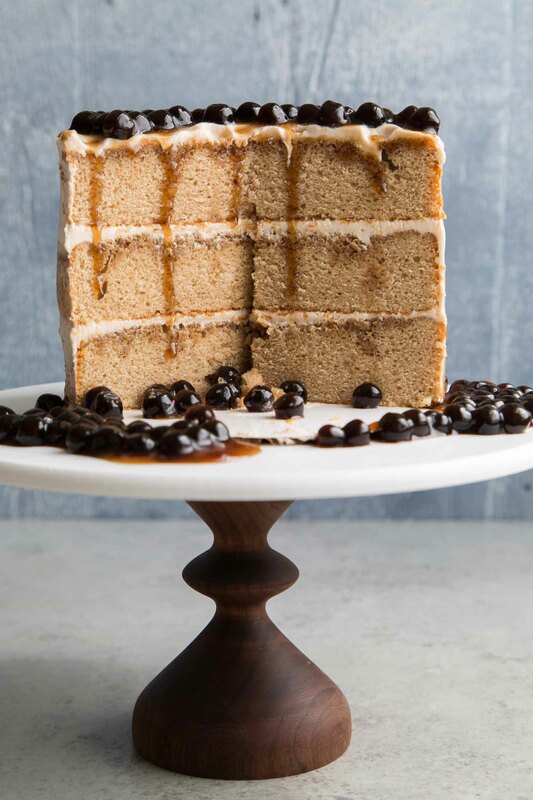 For the finishing touch, the assembled cake is topped with warm brown sugar boba. Warning: Do not refrigerate cooked boba! The warm boba will slightly melt the buttercream. Don’t be alarmed. It adds a pleasant variety to the temperature and texture of the cake. HOWEVER, once you top the cake with boba, I suggest you eat it right away. Find friends, neighbors, and co-workers to share it with. Tapioca pearls are best eaten within hours of cooking. It’s not something you can store in the fridge. It will harden to a rubbery consistency. If you happen to have leftovers of the cake, I suggest removing and discarding the boba before storing the cake in the fridge. Bring milk to a simmer. Add tea and steep for 30 minutes. Strain out tea. Squeeze out as much liquids from tea as possible. Measure remaining liquid. Add additional milk as necessary until you have 3/4 cup liquids. Preheat oven to 350 degrees F. Lightly butter and flour three 6-inch round cake pans. Line with parchment paper. Set aside. In the bowl of a stand mixer fitted with a paddle attachment, combine 2 cups flour (reserve remaining 1/2 cup), sugar, baking powder, and salt. Run mixer on speed. Add butter in three additions. Continue to mix on low speed until mixture is crumbly. In another bowl, combine infused tea milk, eggs, and egg white. Add half of liquid to mixing bowl. Mix on medium speed until incorporated. Scrape down bowl as needed to ensure thorough mixing. Add remaining half of liquid and mix until batter is combined. The batter will look curdled. Add reserved 1/2 cup flour and mix until batter comes together. Evenly distribute batter among prepared cake pans. Bake for 30-35 minutes until toothpick inserted in center of cake comes out clean. Allow cake to cool in pan for 10-15 minutes. 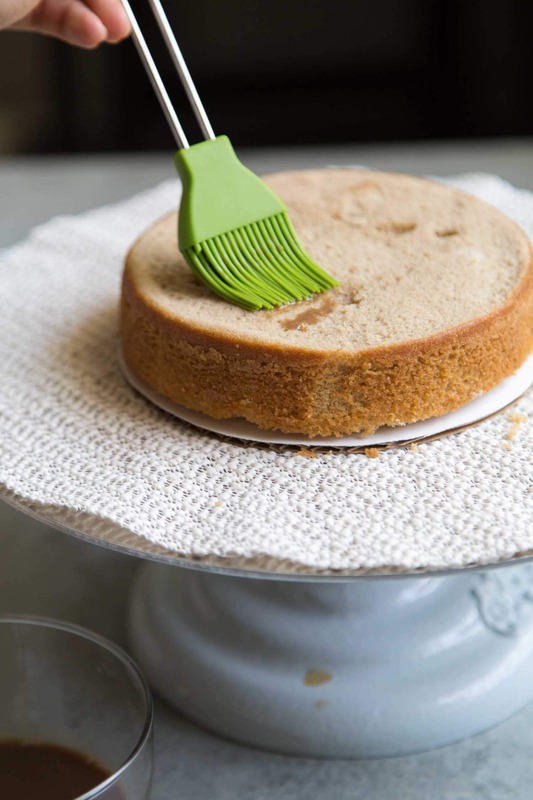 Run an offset spatula along the sides of cake pan to loosen cake. Invert cake onto a wire rack and allow to cool to room temperature. Combine water and sugar in a small sauce pot. Bring to a boil until sugar has dissolve. Remove from heat. Add tea and steep for 20 minutes. Strain out tea. Cool to room temperature and keep store in the fridge until ready to use. Warm milk to a simmer. Add tea bags and let steep for 15 minutes. Squeeze out as much liquid from tea bags. Discard tea bags. Keep chilled until ready to use. In the bowl of a stand mixer fitted with a paddle attachment (or using an electric hand mixer), cream butter until smooth. Add powdered sugar and mix until incorporated. Scrape down bowl as needed. Add vanilla, salt, and milk tea concentrate. Mix until thoroughly combined. 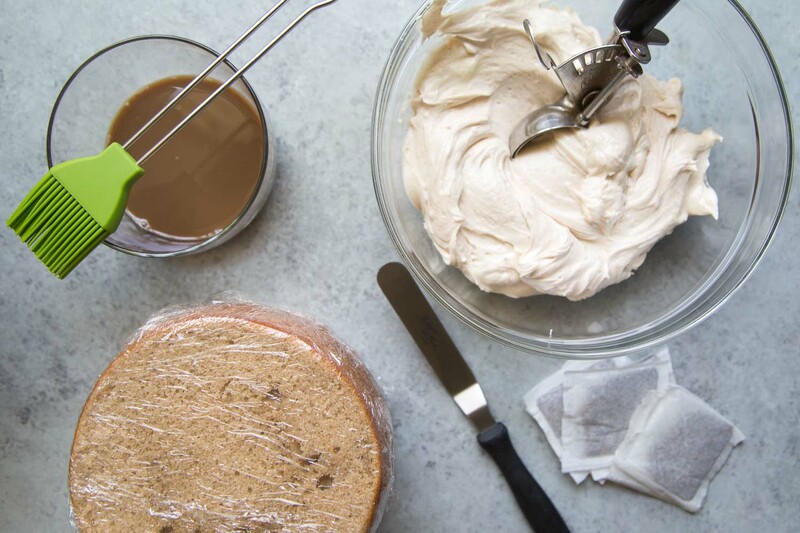 Combine black tea simple syrup and milk tea concentrate before assembling cake. Fill a heavy bottomed sauce pot with 5 cups water. Bring to a boil. Add dried tapioca pearls. Stir to combine and distribute pearls. Allow mixture to continue boiling for about 40 minutes. At this point the pearls should look gelatinous. Reduce heat to a simmer and cook for another 15 minutes until peals are soft and chewy. Add brown sugar and continue to simmer until sugar has dissolved. Remove from heat and allow tapioca pearls to cool. As mixture cools, the syrup will thicken. Keep warm until ready to use. Place one cake round on cake board (or serving plate). Brush cake layer with soaking syrup. Spring a thin layer of buttercream over cake layer. Repeat with second and third cake layer. Spread buttercream around the exterior of cake to seal in any crumbs. Chill in the fridge for 15 minutes to set up. Add another thin coat of buttercream all over cake. Keep cake chilled. Allow cake to sit at room temperature for 15 minutes before serving. 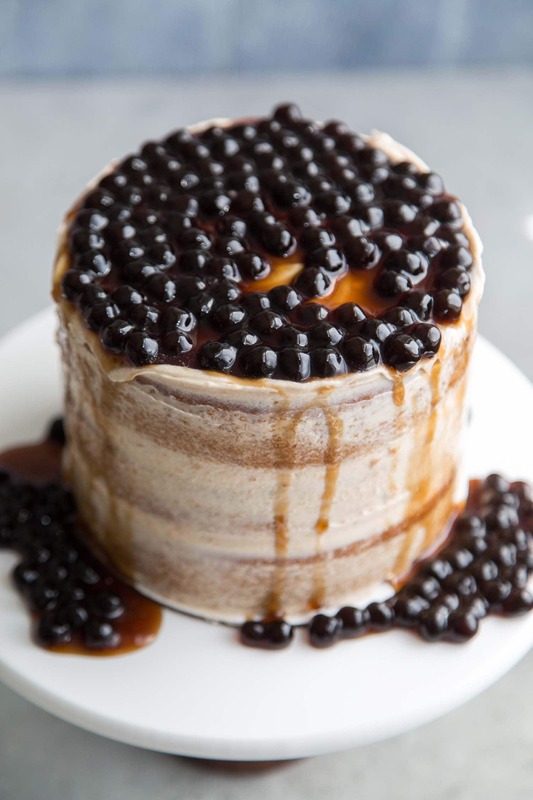 Just before slicing, add warm tapioca pearls to top of cake. Serve cake slices with additional tapioca pearls, if desired. Cake can be made two days in advance. If you have leftovers of the assembled cake, remove and discard boba before storing cake in the fridge. Any tea can be made into milk tea. For this tea, I used standard black tea. I purchase my dried tapioca black pearls from Ten Ren. I go to the location on Broadway (LA Chinatown). They sell large 6.5 pound bags- which roughly making 100 servings of boba. The dried tapioca pearls I used are already sweetened with caramel and maple syrup flavor. There are two types of tapioca pearls: one has a long cooking time while the other one is par-cooked allowing for a much shorter cooking time. I prefer the longer cooking one. Tapioca pearls are best eaten within hours of cooking. DO NOT refrigerate. The pearls will harden to a rubbery consistency. Where to buy tapioca pearls? There are two kinds of dried tapioca pears: quick cooking and the traditional long cooking version. The quick cooking version are par-cooked. I don’t like them as much. I’ve tried several brands but I find them too rubbery. Plus the quick cooking time doesn’t allow for much flavor development. I prefer the long cooking version. I purchase mine at a Taiwanese tea shop, Ten Ren on Broadway in Los Angeles. They sell large 6.5 pound bags that make 100 servings of cooked boba. You can also find dried tapioca pearls at various Asian supermarkets such as 99 Ranch Market, H Mart, Seafood City. Hey! Any suggestions for making this in 9-inch cake pans? It looks INCREDIBLE! This looks DIVINE! Cake and boba are probably my two favorite things on my “treat yo’ self” days so I have to try this! Wow, this looks like such a decadent, delicious cake. Never knew you could make a cake with Boba! Genius! This is a seriously beautiful cake! I love anything with Boba!! May need to try and make this soon! Wow a lot goes in to making this cake. It looks delicious. I so agree with you that bubble tea is hard to put down. You can’t just drink one sip at a time…you just keep slurping. And I’ve made the mistake of putting some leftover tea in the fridge, only to wake up disappointed with how the boba tastes. Definitely not something to refrigerate! That is such a creative cake, and I so want to try it! I’ve never seen boba in anything other than tea-how fun! I love these type of cakes. This looks so yummy! This looks and sounds amazing! Will def has to be made at my next dinner party! This cake looks so unique and delicious! I’m intrigued with the mixing technique used to achieve the tight crumb. Very interesting. Oh my goodness! What a beautiful, stylish Boba Milk Tea Cake! I am so excited to get started on this delicious recipe. This is so clever! I love the sound of adding tea to cake, as it’s two of my favorite things in the world. And beautiful pictures too!